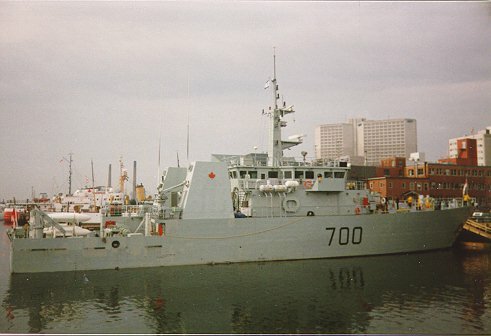 This design dates to the 1980's, when it was apparent that the then-current fleet of training ships were in desperate need of replacement. 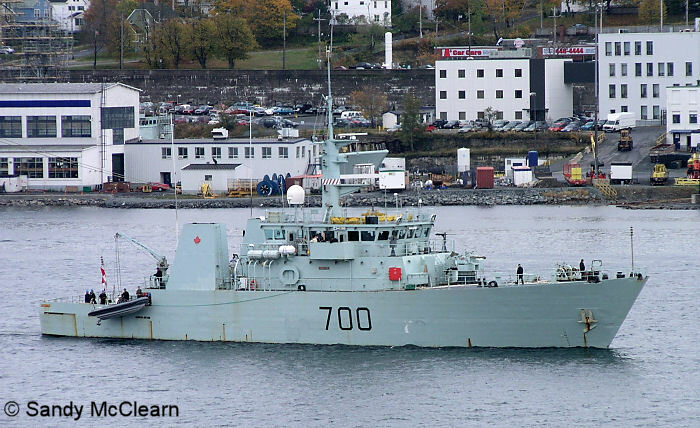 Also, it was necessary to reclaim some of the mine countermeasures capability that had been lost since WWII in the Canadian Navy. 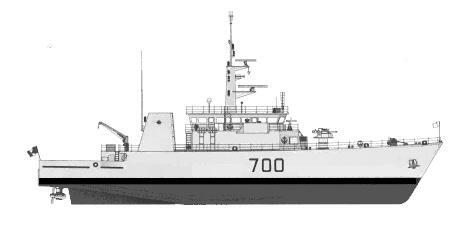 Therefore, the KINGSTON class of MCDV's (Maritime Coastal Defence Vessels) was ordered. 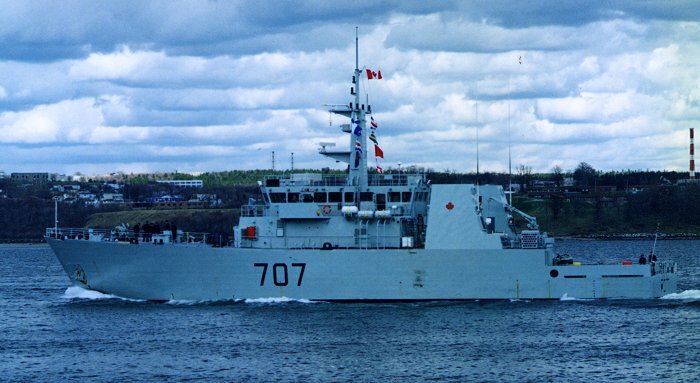 They are largely being manned by the Naval Reserves, and provide valuable training for the reserves while freeing up regular force personnel for other duties. 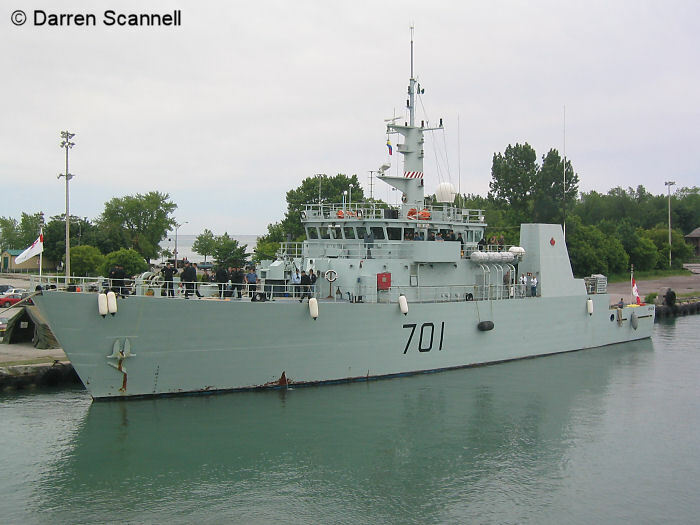 These ships carry out a multitude of missions, including coastal patrol, light mine countermeasures, route surveys, ROV handling, and will take on some of the duties formerly carried out by the fleet dive tender, HMCS CORMORANT. 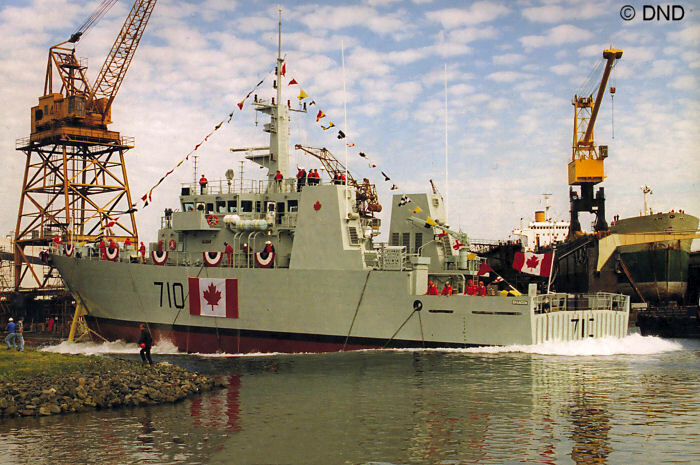 As a cost saving measure, the KINGSTON class are largely built to civilian standards. 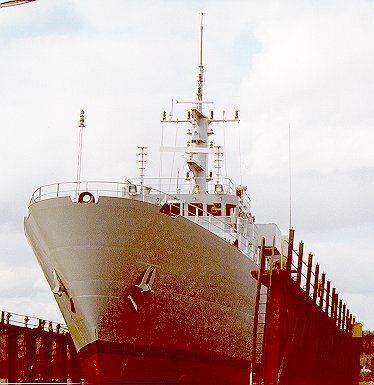 When first launched, it was discovered that these ships suffered from a slight list: this problem was corrected by the addition of extra ballast. 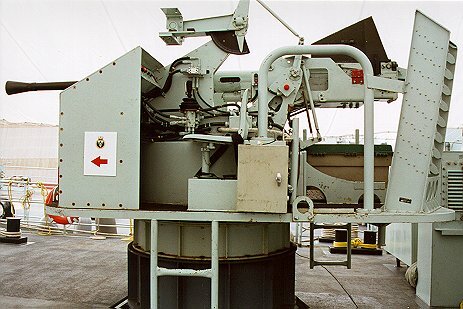 The ships have a diesel - electric propulsion system which drives two azimuth, or Z-, drives. 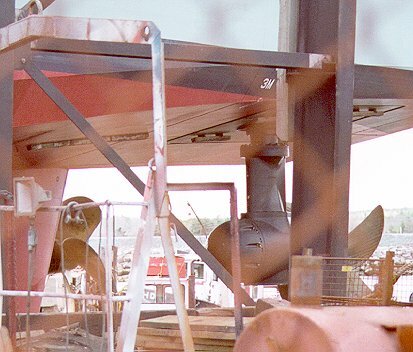 These are two fixed pitch propellers situated side-by-side at the stern, rather like two outboard motors, each which can rotate a full 360 degrees. This makes these ships extremely maneuverable. 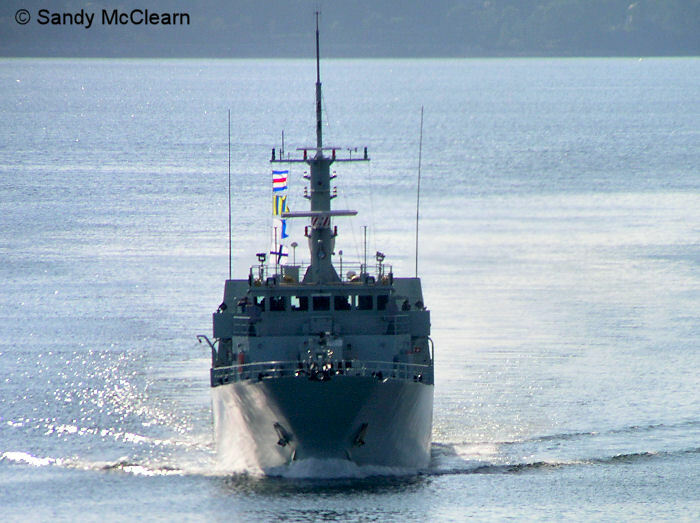 Many ships have been send far afield, with some taking part in exercises in Europe. However, they are not designed for open ocean transits, and it was discovered that they had a tendency to hull-slam in heavy seas. Some research has been done to look into modifications to the control system that will reduce the severity of this problem. 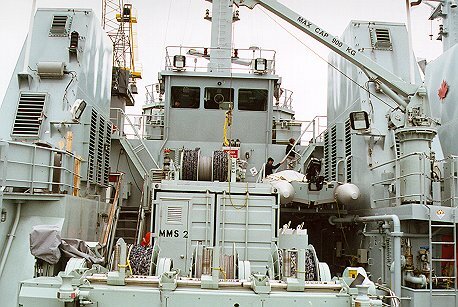 The various payloads (for minesweeping, ROVs, sidescan sonar, etc) for these ships are modular, meaning that they can be embarked and disembarked with relative ease, and moved from ship to ship as required. There are not enough payload packages to equip all the ships at one time. 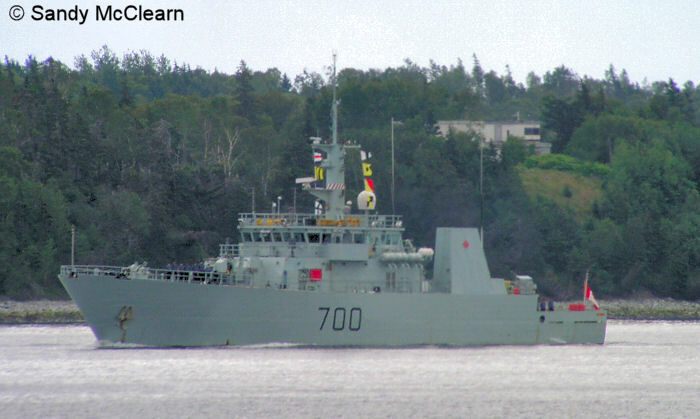 The guns carried by these ships are Second World War surplus, and are very limited in capability. 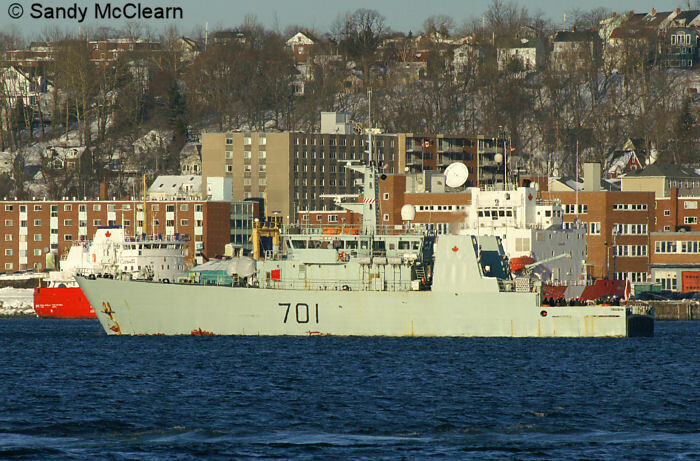 These guns have been in the Navy for many years, serving on such ships as the PRESTONIAN class ocean escorts, TRIBAL class and ST. LAURENT class destroyers, Bay class minesweepers, Porte class gate vessels, and in Europe on airbases for anti-aircraft defence. 2. 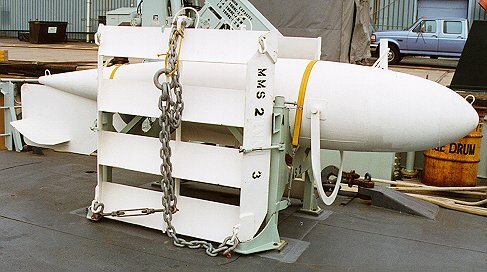 A detailed profile of a KINGSTON class MCDV. 3. KINGSTON on the Halifax waterfront. ('96) Stacey Hare photo. 4. 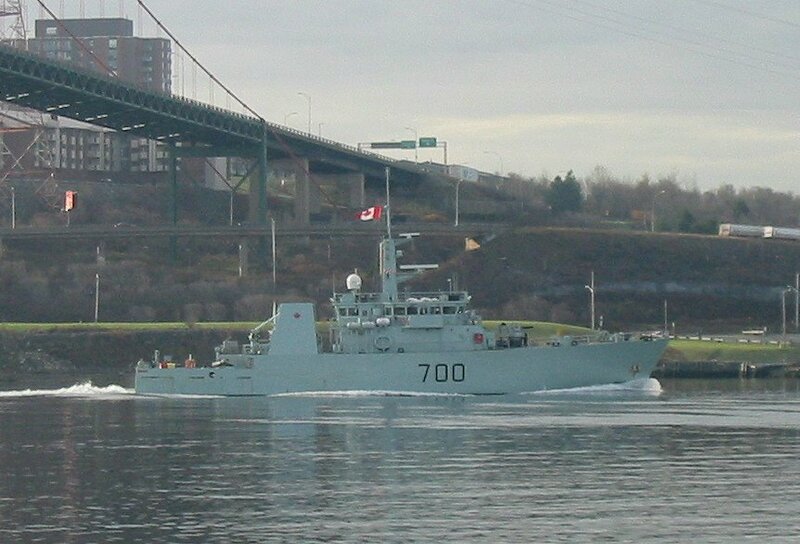 KINGSTON in Halifax Harbour. (03/98) Sandy McClearn photo. 5. 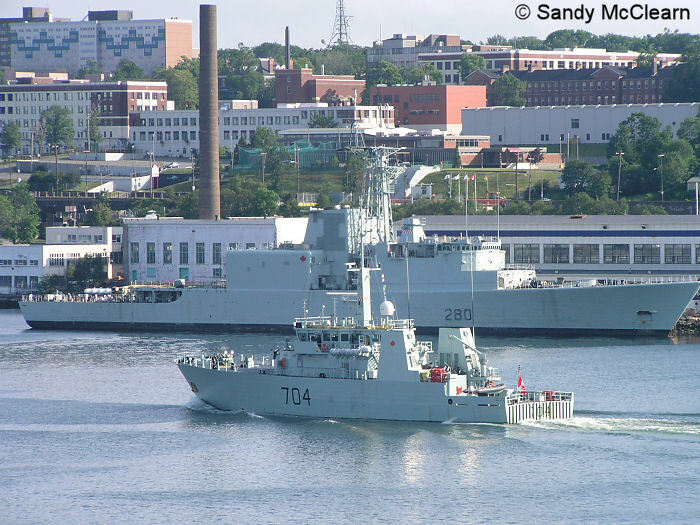 KINGSTON passes McNab's Island as she enters Halifax Harbour. Sandy McClearn photo. 6. KINGSTON lowers a RHIB into the water. Sandy McClearn photo. 2. The bridge of GLACE BAY. 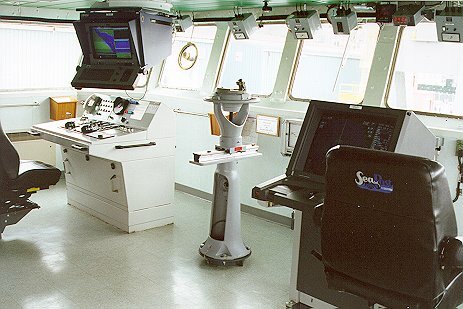 The radar display is on the right, compass in the middle, helm on the bottom left, and the ECPINS (Electronic Chart Precise Integrated Navigation System) is on the left hanging from above. ('97) Sandy McClearn photo. 3. GLACE BAY's helm main station. There is an addition station on each bridge wing. 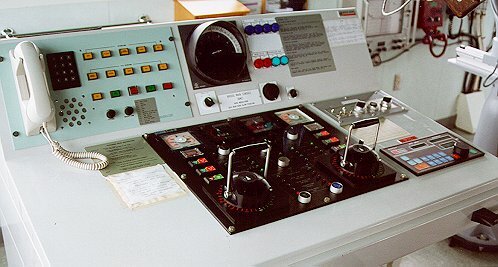 The two handles in the picture control the two Z-drives; push or pull the lever to control throttle, and turn the handles to orient the Z-drives. ('97) Sandy McClearn photo. 4. 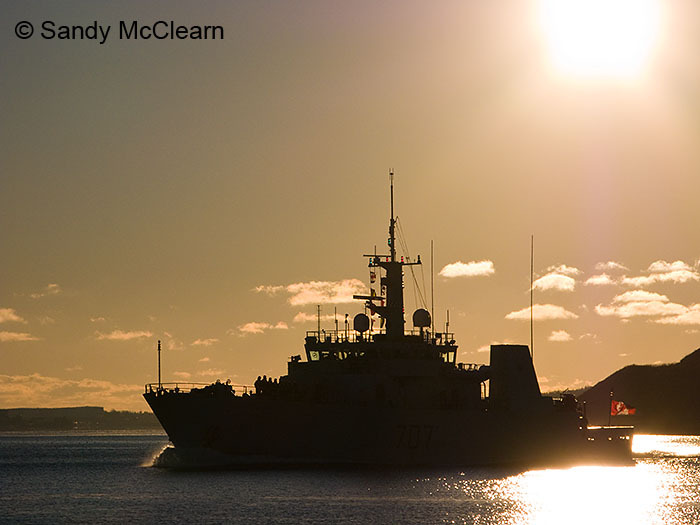 Looking forward from the quarterdeck on GLACE BAY. 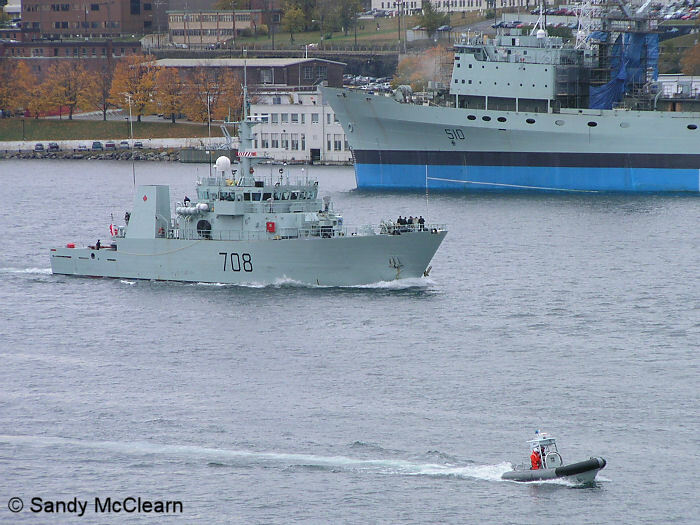 Note the modular cargo container in the middle. ('97) Sandy McClearn photo. 5. 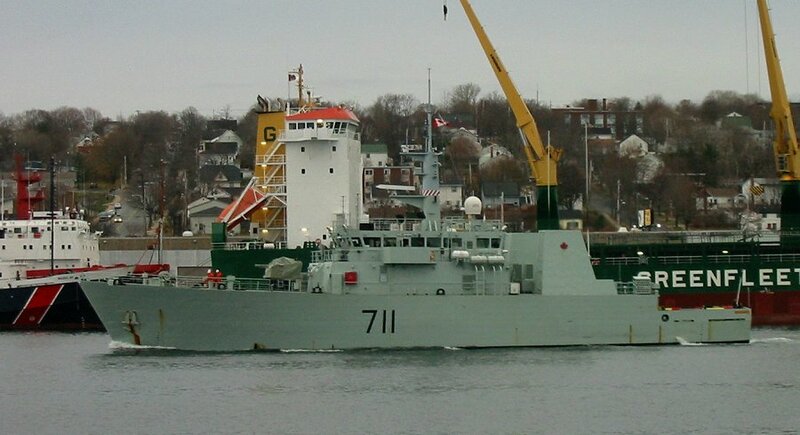 One of the two floats that belong to the minesweeping module on GLACE BAY. ('97) Sandy McClearn photo. 6. 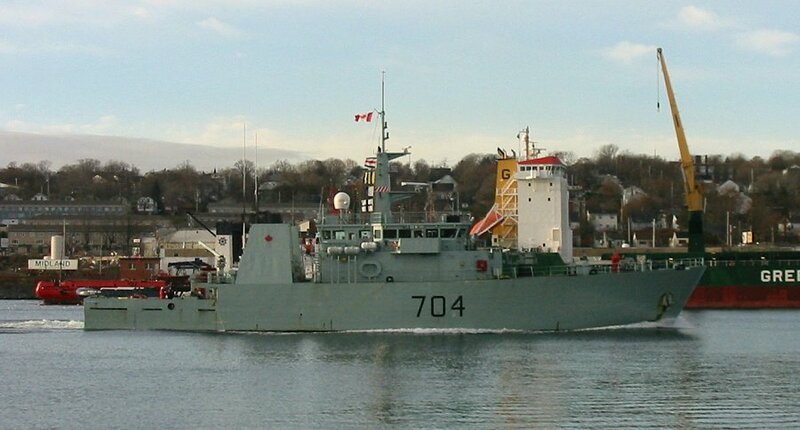 The 40mm Bofors on GLACE BAY. ('97) Sandy McClearn photo. 7. 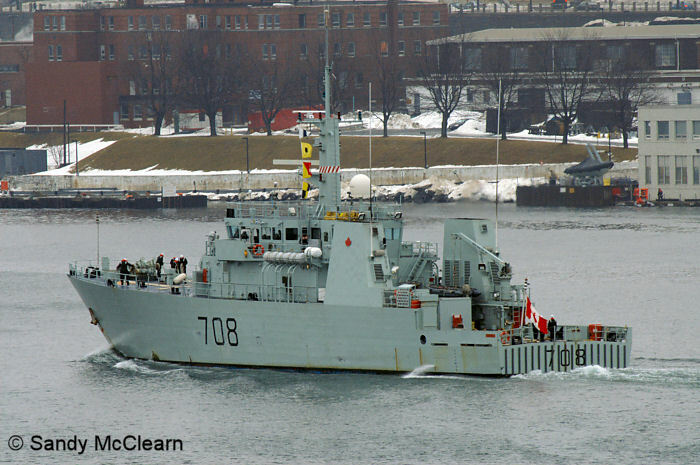 GLACE BAY lies anchored in front of the Canadian Coast Guard base in Dartmouth, NS. Sandy McClearn photo. 8. 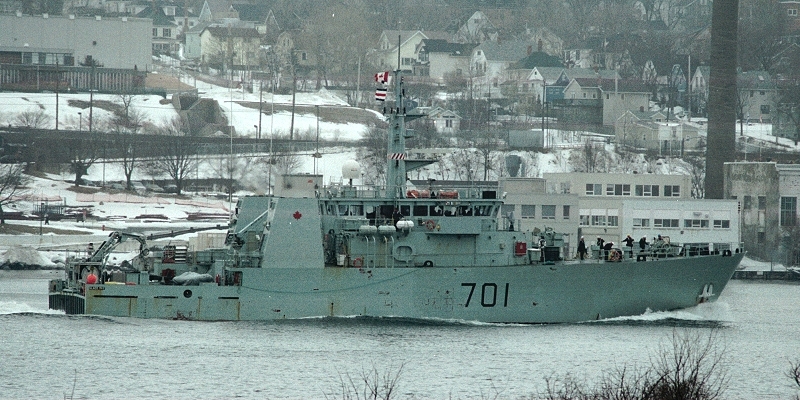 GLACE BAY in the Great Lakes. Darren Scannell photo. 9. 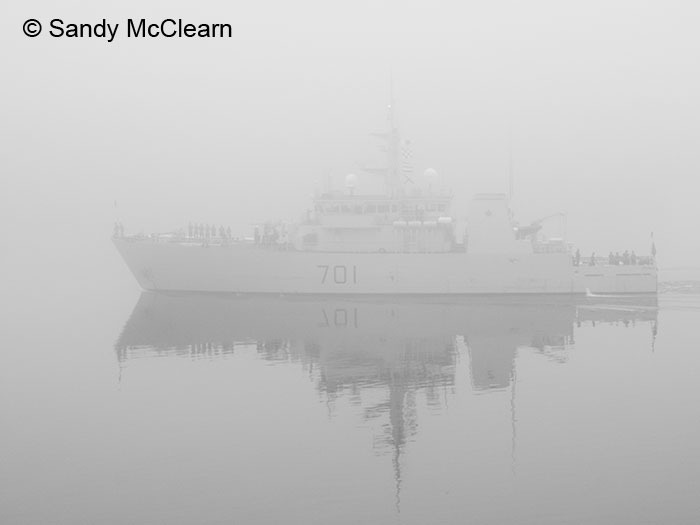 GLACE BAY underway in thick fog. (2007) Sandy McClearn photo. 1. 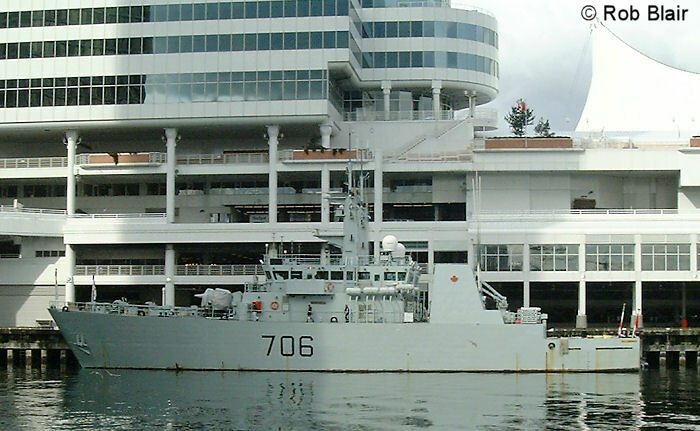 NANAIMO outside Esquimalt. DND photo. 2. 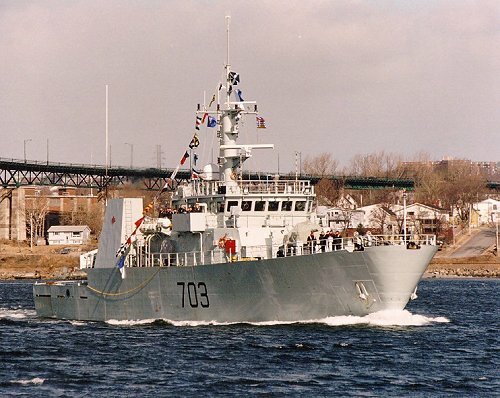 NANAIMO in Halifax Harbour in 1996; she has not yet been fitted with her Bofors gun. Sandy McClearn photo. 1. 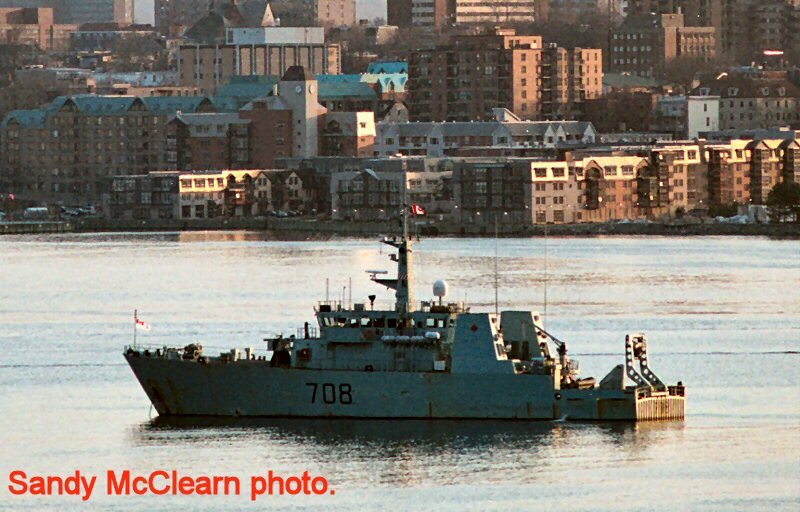 HMCS EDMONTON in Halifax Harbour. DND photo. 3. 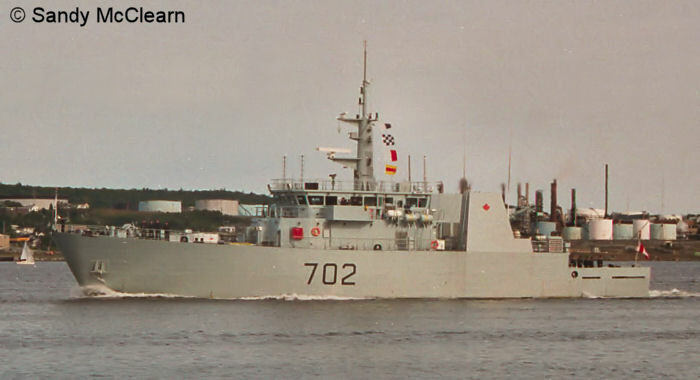 SHAWINIGAN enters the narrows of Halifax Harbour. Sandy McClearn photo. 4. 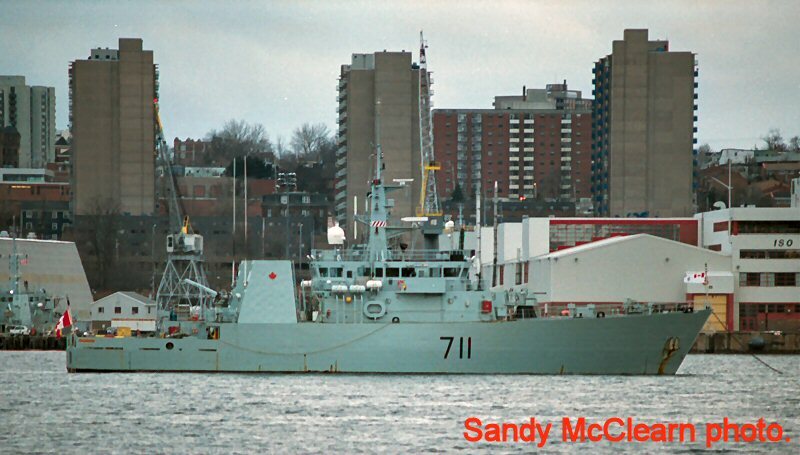 Passing HMCS IROQUOIS, undergoing a refit at the Halifax Shipyard. Sandy McClearn photo. 5. 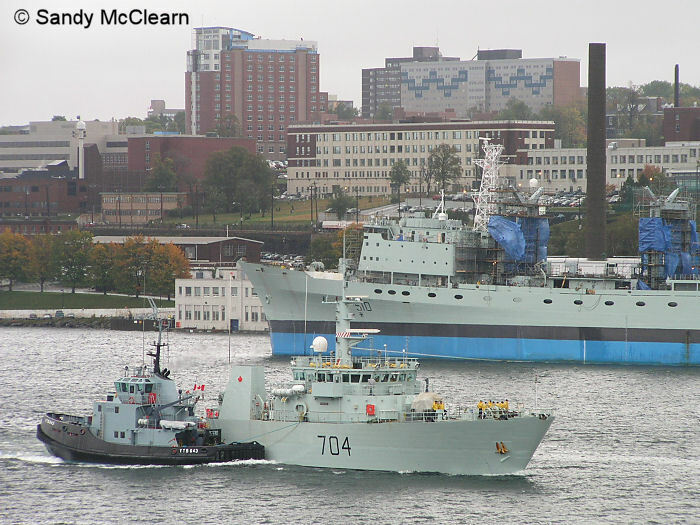 A Glen class tug tows SHAWINIGAN past HMCS PRESERVER towards Bedford Basin. Sandy McClearn photo. 1. 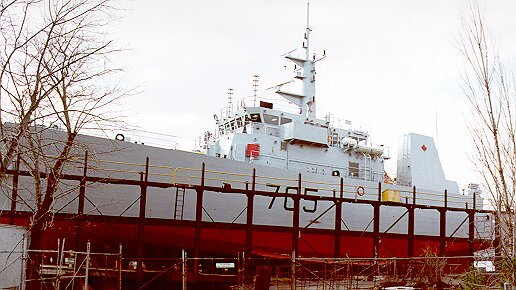 WHITEHORSE on the slip in Liverpool, NS. (04/97) Sandy McClearn photo. 2. The Z-drives on WHITEHORSE. (04/97) Sandy McClearn photo. 3. WHITEHORSE again. (04/97) Sandy McClearn photo. 4. 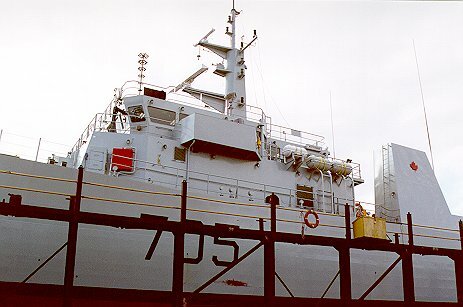 Bow view of WHITEHORSE on the slip. (04/97) Sandy McClearn photo. 1. YELLOWKNIFE in Vancouver, BC. Rob Blair photo. 1. 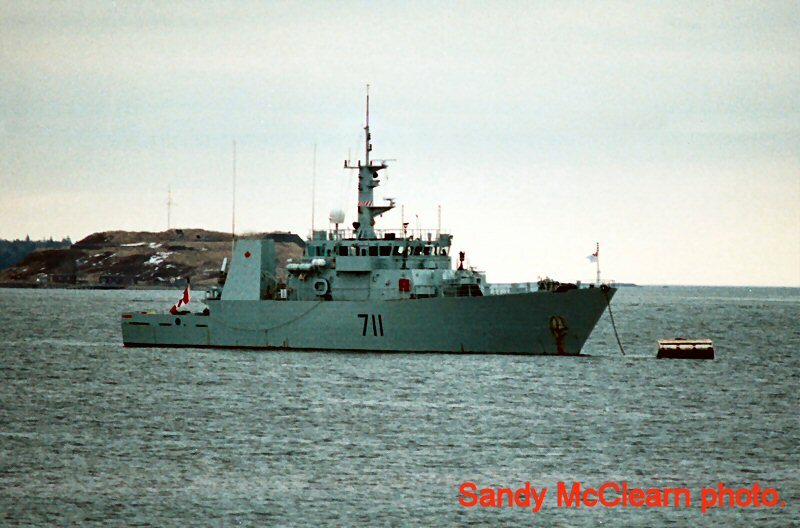 GOOSE BAY during the winter of 1998. Sandy McClearn photo. 2. 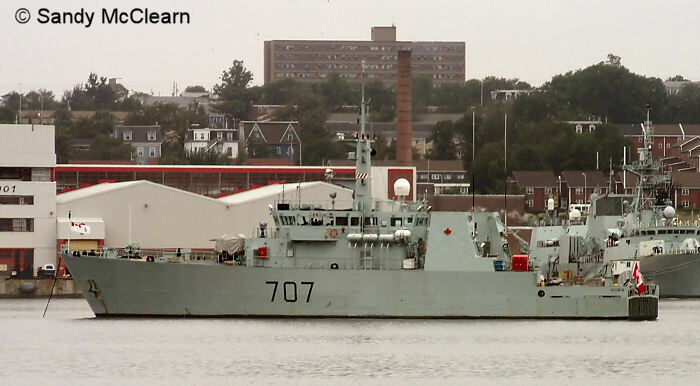 GOOSE BAY lies at anchor in front of HRC Dockyard in Halifax. Sandy McClearn photo. 3. GOOSE BAY at sunrise. (2008) Sandy McClearn photo. 4. 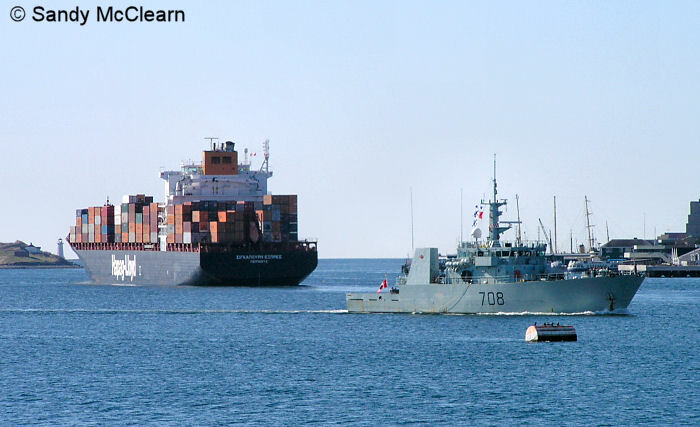 MONCTON passes a large container ship in Halifax Harbour. Sandy McClearn photo. 1. BRANDON slides down the launchway at the Halifax Shipyard. DND photo. 5. 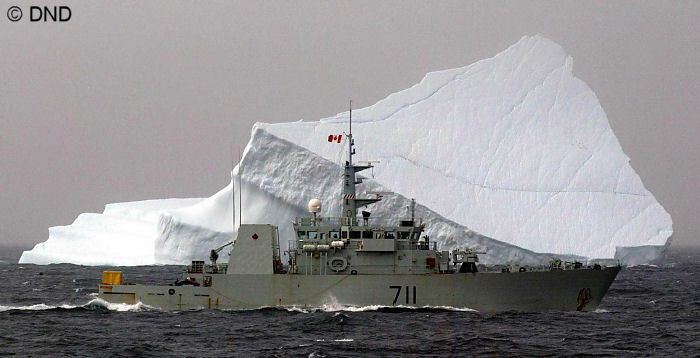 SUMMERSIDE passes an iceberg. DND photo.